The Wham-O Wave Rider Slip-N-Slide with Boogie offers kidsa way to cool down during the summer with a fast-paced, drenching thrill ride!A fun spin on a classic summer favorite, the Wave Rider features Wham-O'sbumper spray action, which continuously sprays water from the bumper system tothe splash pool for a guaranteed wet ride! Featuring Hydro-Glide technology,your child will quickly and easily glide down the slide into the splash pool.A bonus inflatable boogie board is also included for an even smoother ride.This backyard toy is recommended for children ages 5 to 12 years. 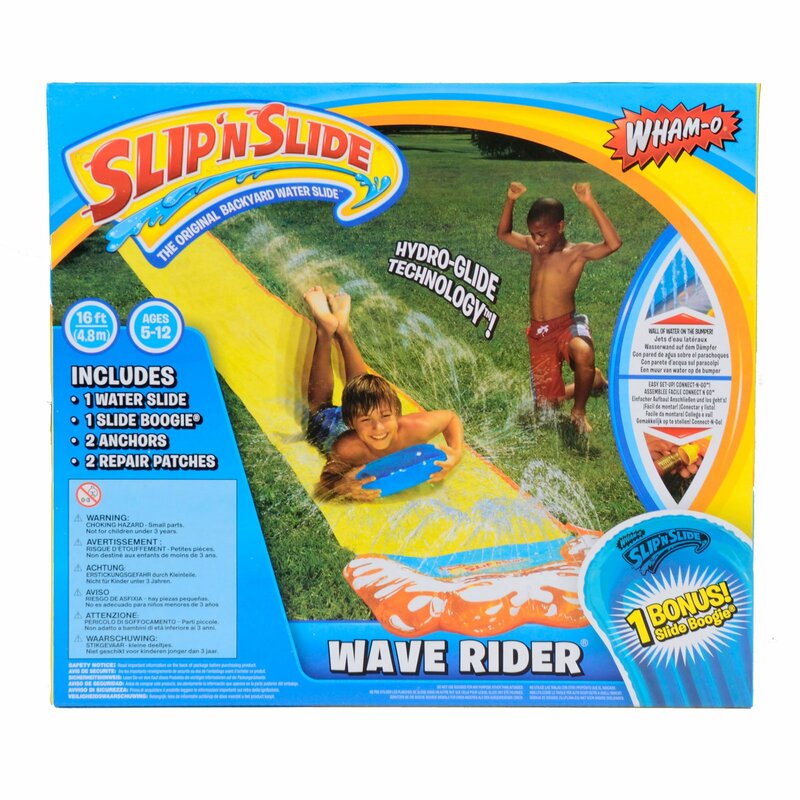 The Wham-OWave Rider Slip-N-Slide is the ultimate way to cool off during those hotsummer months! The Colors may vary. From the Manufacturer Enjoy this Wild WaveRider with Bonus Slide Boogie. 16" hydro-glide Technology which creates beadsof water for faster slide action. Connect 'N Go self-filing water bumper.Includes bonus inflatable slide boogie. For ages 5-12 years.